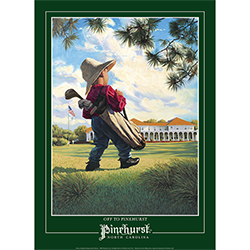 The Off to Pinehurst poster features the Golf Lad approaching the Pinehurst Resort Clubhouse. This Golf Lad image is one of several created for Pinehurst Resort by talented artist, Eric Johnson. Poster size: 22" x 16"